The first post office in Santa Claus, Indiana, opened in 1856. However, the town became famous under the direction of its fourteenth postmaster, James F. Martin. In 1914, Martin began to answer the letters addressed to Santa Claus that were received from children. Because of this act of kindness, people began to flock to this little Indiana town – so much so that in the early 1930s the United States Postal Department unsuccessfully sought to change the name of the town. 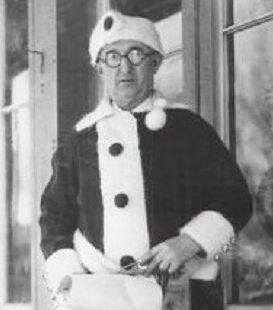 Martin and the town of Santa Claus even caught the attention of cartoonist Robert Ripley and appeared in his “Believe It or Not” column in the 1930s. In the early days, Martin would sometimes dress in the famous red suit to the delight of post office patrons who flocked in for that special postmark. Today, a non-profit organization called Santa’s Elves, Inc. carry on the wonderful tradition; keeping James F. Martin’s and the town of Santa Claus’ historic legacy alive.